Ideally situated in quiet Honeydew Manor, Savannah Lodge Apartments offer luxurious, fully furnished and fitted apartments, 1km away from restaurants and shops, with easy access to main roads. King, queen or twin single orthopedic beds with layers of crisp percale linen, throws and warm blankets for superior sleep, DStv Compact Bouquet with 84 channels, workstation and a fully fitted bathroom with fluffy bath sheets, body lotion and shampoo. A fully fitted kitchen with freshly ground coffee, tea and shortbread biscuits. A patio for leisurely breakfasts and a pool for a cool dip. Eat out from steak to Italian ......... or eat in with a take away from numerous restaurants within a 1km radius. Covered parking bays with 24 hour security takes of care of the safety of our guests. Airport transfers and laundromat within a 3km distance. Numerous restaurants, shops, Virgin Active gym, Eagle Canyon golf course and medical suites within a 2km radius. Clearwater, Cradlestone and Northgate Malls, Northgate Dome, Wilgeheuwel and Flora Clinics, Silverstar Casino, Walter Sisulu Botanical Gardens, Monash University, Maragon and Trinityhouse schools within a 5km radius. Lanseria Airport, Cradle of Mankind, Lion and Rhino Park, Brookwood Trout Farm all within a 25km radius. FNB Stadium is a 15 minute drive. Family friendly: The lodge provides a safe pool area. 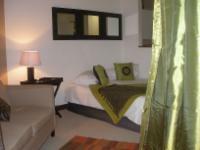 Romantic: A fully furnished, luxurious and private apartment for honeymoon couples, with complimentary champagne. A 50% deposit will secure your booking. The balance is payable 10 days before arrival. Strictly no smoking inside the apartments. No overcrowding allowed. If found smoking or overcrowding, then a fine of R600 will be imposed, as well the appropriate rate will be charged for the extra guest/s. I booked the place for a total of 4 people and I specified that 3 of them would be in one apartment. I expected at least 2 double beds for these 3. However the apartment allocated for them had only one double bed. This was not what I expected based on what I requested. Our unit was tastefully decorated and comfortable. Savannah Lodge Honeydew is 16.6km from the centre of Johannesburg , the nearest airport 18.7km (Lanseria International Airport).